We are only too well aware that expert fitting of your carpet is rightly expected as standard. Sadly this is not always the case. All of our fitters are "time served" - by that we mean that they have served a traditional apprenticeship in the craft of carpet fitting. 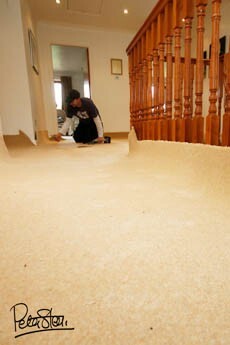 Each of our carpet fitters has more than 20 years carpet fitting experience. We are sympathetic to customer needs and therefore we'll arrange to fit your carpet at a time to suit you...not us! We will always be as accommodating as we possibly can. Uplift and dispose of your existing carpet. Clear rooms of furniture etc prior to fitting your new carpet. Remove and trim doors if clearance is not sufficient. After installation of your new carpet we shall remove all the waste from the job and finally will then vacuum it for you! After your job has been completed we follow up your order with a note thanking you for your much-valued business and to check that we have met our required standard of in-store service, delivery schedules being met and that our fitters work and manner met your expectations.